Q: When is it a good time to give your boss one of your only two remaining $24 sheet masks? A: When she makes you. Real answer: When she compliments your skin and asks what you used the night before, and you’re in need of a guinea pig to validate your own experience anyway. This product was provided at my request by Sulwhasoo US. Affiliate links, which enable me to earn a commission on purchases made by clicking them, are marked with an asterisk(*). It was December 26, 2017. I and the rest of Beautytap‘s US team had convened in our Los Angeles Koreatown office for a two-day meeting. During a lull in the planning sessions, our Director of Global Operations looked across the table at me and said I had a “severe glow,” which is a compliment, not a medical condition. She asked me what I’d done differently. 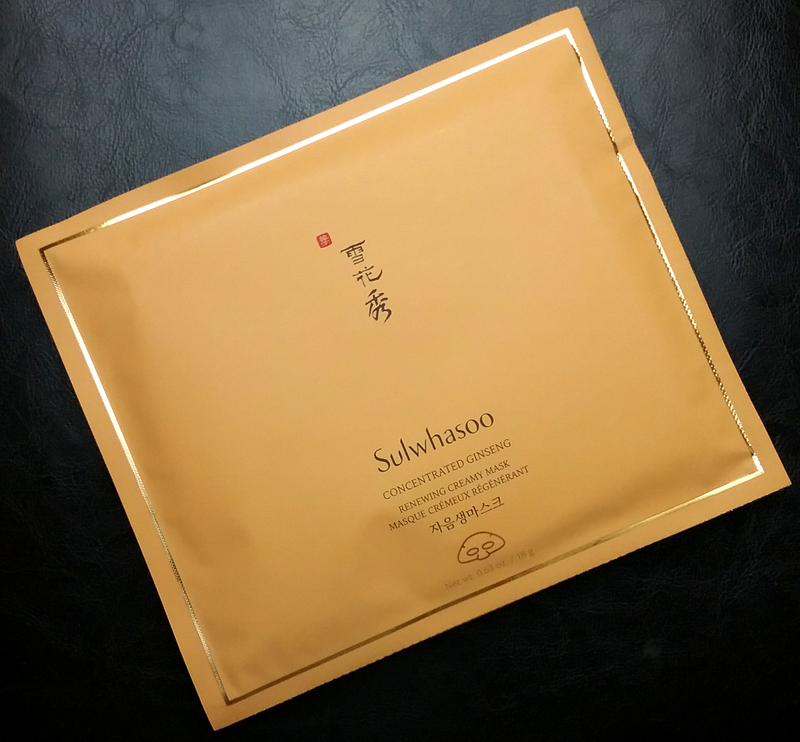 What I had done differently from the last few times we’d seen each other was to use one of my Sulwhasoo Concentrated Ginseng Renewing Creamy Mask sheet masks the night before. I happened to have another one in my travel bag, which happened to still be at the office because I hadn’t gone to my hotel yet. I pulled the mask out and compliantly handed it over. This is my review of these masks, but in a way, it’s also my boss’s review. When the Concentrated Ginseng Renewing Creamy Mask appeared on Sulwhasoo US’s Instagram, I felt instant excitement, followed by near-instant doubt. See, when I love Sulwhasoo products, I really love them, but when I don’t love them, I really don’t. (See: disappointingly meh Snowise serum, upsettingly gross-feeling Innerise mask, and utterly horrifying sunscreen). I know I love ginseng skincare though, and I know I love creamy sheet masks, so I asked for a box and hoped for the best. 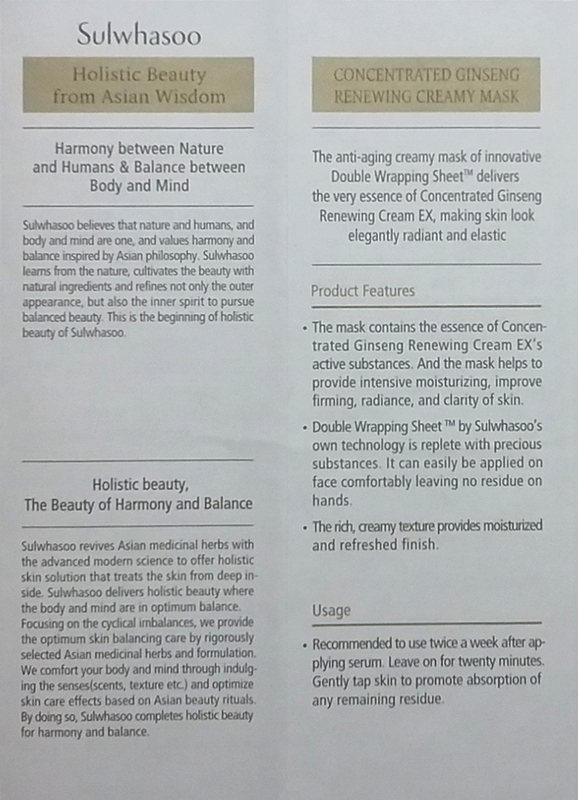 Purpose: Sulwhasoo claims that the Concentrated Ginseng Renewing Creamy Masks provide intensive moisture and increase skin’s firmness, elasticity, and radiance. Best suited for: All skin types, but especially dull skin suffering from a decrease in firmness and elasticity. Very oily skin types may find the finish a little heavy. Very dry skin types may not get enough moisture. Do not use if: You are sensitive to silicones, shea butter, vitamin E, fragrance, limonene, linalool, or anything else in the ingredients list. When and how to use: Use at the end of your skincare routine, after any toner, essence, and serum steps. Take one half of the mask (doesn’t really matter which) out of its pouch. 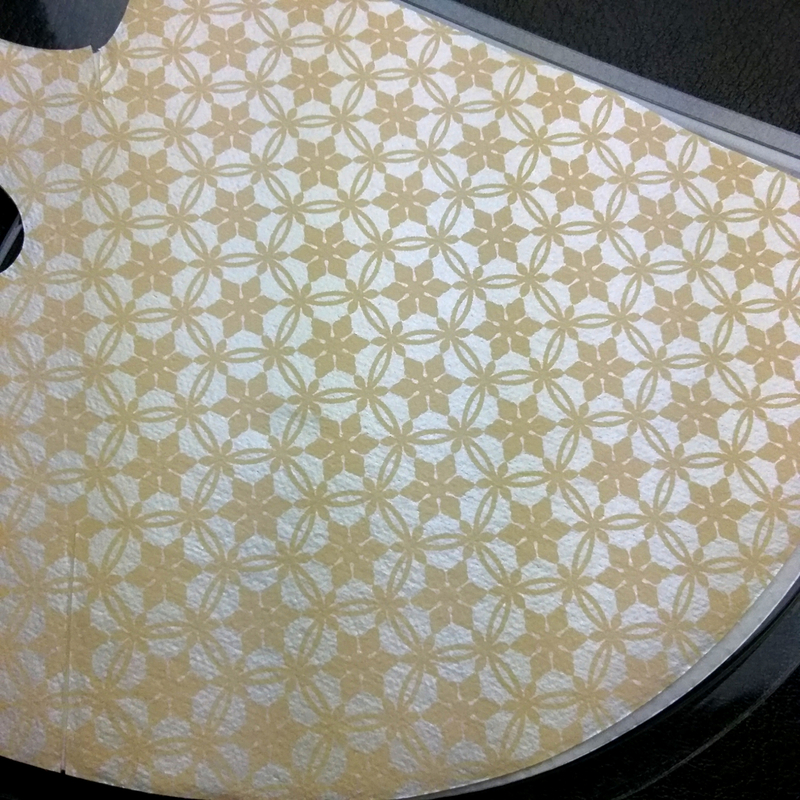 Open the plastic tray and remove the folded mask inside. Unfold the mask and carefully remove the plastic backing. Feel increasingly worse about the amount of packaging involved. Find a use for the bit of essence on the backing. 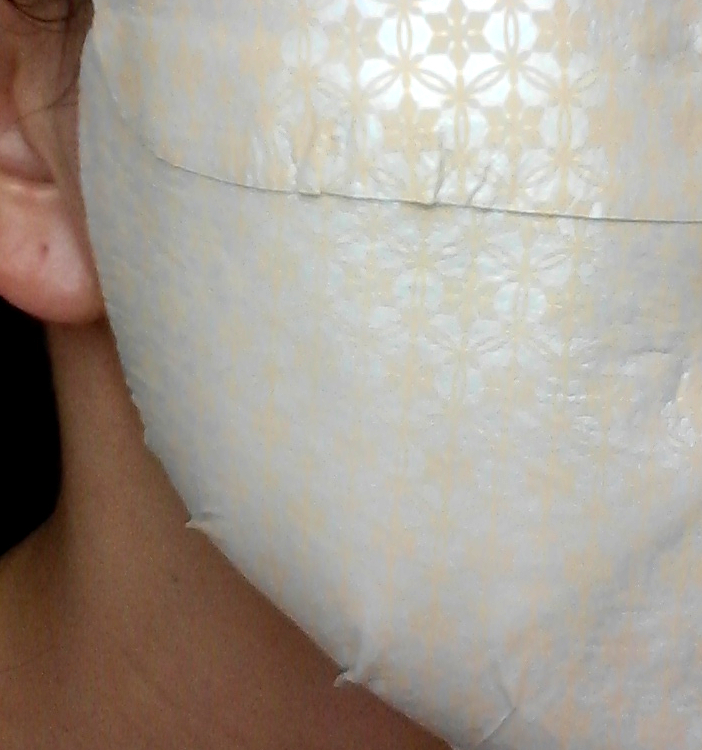 Apply the mask half to face, patterned side facing out. Repeat with the other half of the mask. Leave on for 20+ minutes. Pat or massage any excess cream into skin. Ingredient notes: The Instagram post I linked above describes these masks as having “a high concentration of Concentrated Ginseng Renewing Cream EX.” The Concentrated Ginseng Renewing Creamy Masks do share a lot of the same ingredients as the cream of the same name, including most of the exciting-sounding herbal extracts, but the formulations aren’t the same. So if you were thinking these would be mask sheets saturated with the actual Concentrated Ginseng Renewing Cream, sorry. The extracts are also lower down in the list than they are in the cream. This doesn’t necessarily mean they won’t do anything: factors like extract concentration mean that a product that lists an extract first but uses a very diluted extract may be less potent than one that lists the extract much lower but uses a more concentrated, high quality version. Extract potency is, unfortunately, privileged information for the brands and the extract suppliers, so we really can’t tell from ingredients lists just how concentrated anything is. Still, it’s pretty disheartening to see all the extracts except ginseng listed below fragrance, which is generally used in very low concentrations in skincare products. They contain “the essence” of the ginseng cream’s “active substances.” Oh. Okay then. The bulk of most sheet mask ingredients are the hydrating ones. Creamy masks like these typically swap out hydrating for moisturizing emollient ingredients, as well as emulsifiers to bind the water and oil components together (so, basically, the ingredients that make creams creamy). That holds true with these masks. The top portion of the ingredients list is mostly moisturizing ingredients–a mix of naturally derived ones like squalane and shea butter (and water), and a variety of silicones. The fun extracts with their possible anti-aging, brightening, and anti-inflammatory herbally hanbangy effects appear lower down. With all that being said, you really can’t tell if a product will be good for your face based on ingredient order alone. If it were so black and white, every brand and indie formulator could crack the code. Also, the not-fun ingredients in most skincare, like emollients, deliver the majority of the actual immediate results, especially when it comes to skin texture. Do the masks do the thing and feel good while doing it? The only way to find out for oneself is by trying them. So we did. Did you notice my excessively detailed usage instructions earlier? They’re excessively detailed because these masks are excessively packaged. Cut into two pieces (one for the upper half of the face and one for the lower, like most hydrogel masks), the Concentrated Ginseng Renewing Creamy Masks come in double-sized, dual-chambered pouches. 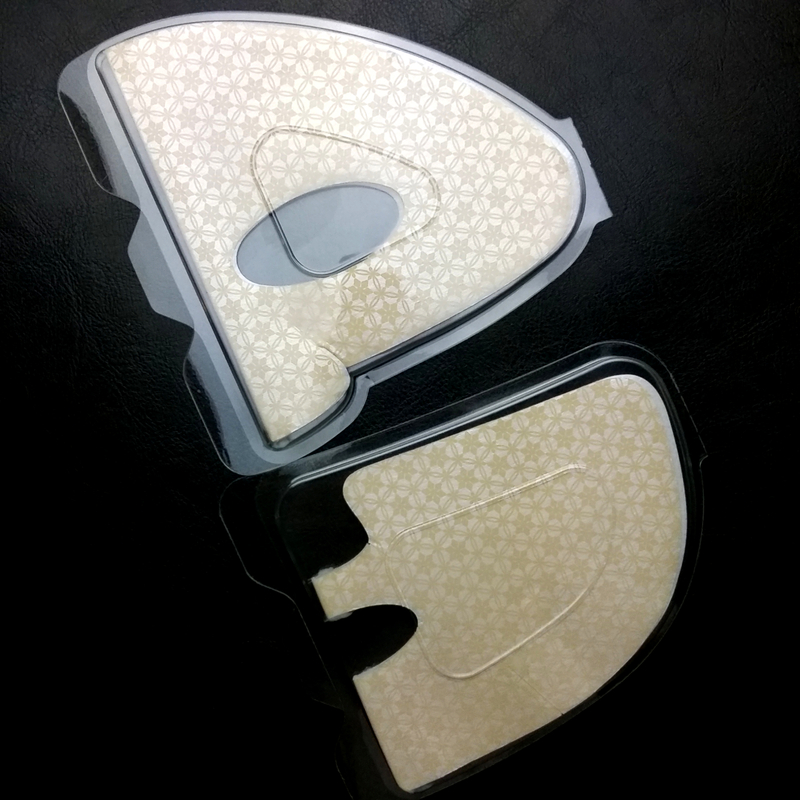 Each pouch contains one half of the mask, neatly folded into its own plastic tray. There is no extra essence flopping about on the inside of the pouch, begging to be massaged into arms and legs. There’s not even any extra essence in the plastic trays. It’s all on the back of each mask half. The only extra essence you’ll get is what comes off onto the plastic mask backings, which is little enough that I just swipe those quickly across my face before applying the actual masks. The essence itself is creamy, with that delightful signature Sulwhasoo ginseng scent, deep and earthy without smelling like twigs or dirt. Mask on the left, backing on the right. The cream left over on the backing. 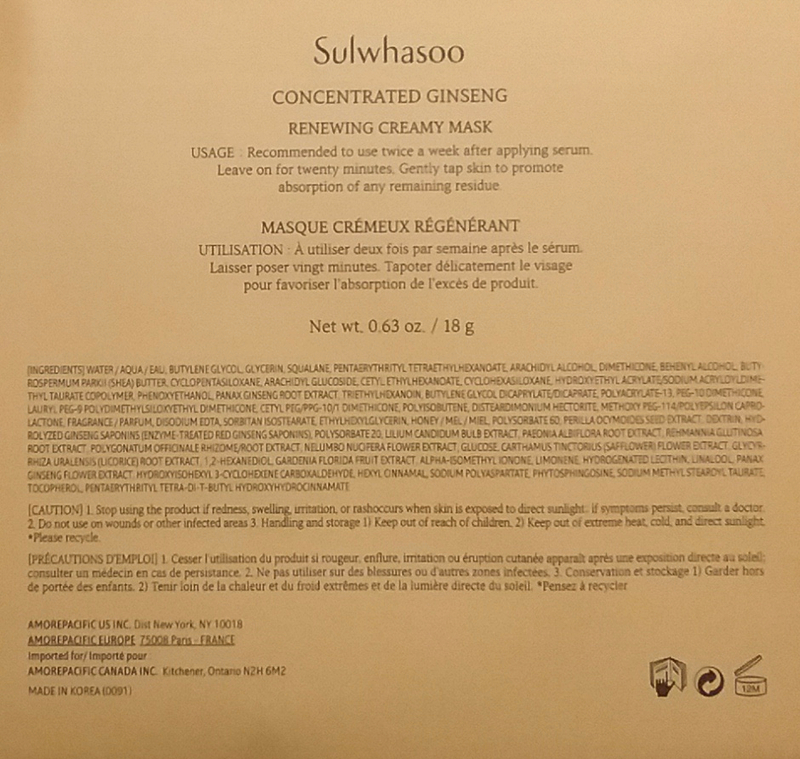 Sulwhasoo’s website currently describes these masks as “the world’s first-ever cream-textured sheet mask,” which seems to need some clarification, because it’s not true. There are lots of creamy sheet masks. This cream is one of the thickest I’ve seen in a sheet mask, though. The mask sheets themselves are unspeakably fancy. The side meant to go against your face is finely textured and amazingly soft, while the side meant to face outwards has a pearlescent coating that prevents product from soaking through and is printed with the elegant Sulwhasoo pattern. My friend Anna, @maskaddict on Instagram, says it’s like wearing a designer handbag on your face. I think the distinct outer coating and inner sheet are what Sulwhasoo means by “Double Wrapping Sheet™” technology. Pretty sure I’ve used other masks that have a similar system, so we’re going 0 for 2 here on the claimed innovations front. Anyway, once I have a pile of discarded packaging in front of me (making me feel like a bad, bad person even though I will recycle as much of it as I can) and a Concentrated Ginseng Renewing Creamy Mask settled on my face, I do deeply enjoy the feel of the mask. The microfiber(?) inner layer and thick cream essence give the sheets a lot of cling. They sit smoothly and tightly on the contours of my face, and they don’t slide around. These are the type of masks that can be worn comfortably for a whole evening. Though the mask instructions say to leave them on for 20 minutes, I prefer to go much longer than that. The creamy essence makes doing so easy, since it doesn’t sink in and dry out the way watery masks do. Even after an hour or more, I end up with a thin layer of cream on top of my skin. My skin is a dryish normal. When it feels more normal or only a little dry, the Concentrated Ginseng Renewing Creamy Mask doubles nicely as my moisturizer for the night. On a couple of very dry nights, though, my skin felt like it needed more moisture than the masks provided. Unfortunately, the richness of the essence made adding another moisturizer on top uncomfortable. Applying cream took the sensation from “not quite enough” to “way too much.” The best solution I found was to layer on a thin sleeping pack, like COSRX honey sleeping pack, as a final occlusive layer. These masks also don’t hydrate much. Then again, I don’t expect hydration from a creamy mask, and they do say to use them after your hydrating layers, so that makes sense. As for results, here I have zero complaints. The immediate effects of these masks are subtly brighter and firmer and noticeably smoother skin. Any surface crepiness is reduced, and my face gains a soft glow. But the true effects don’t come out until the next morning. 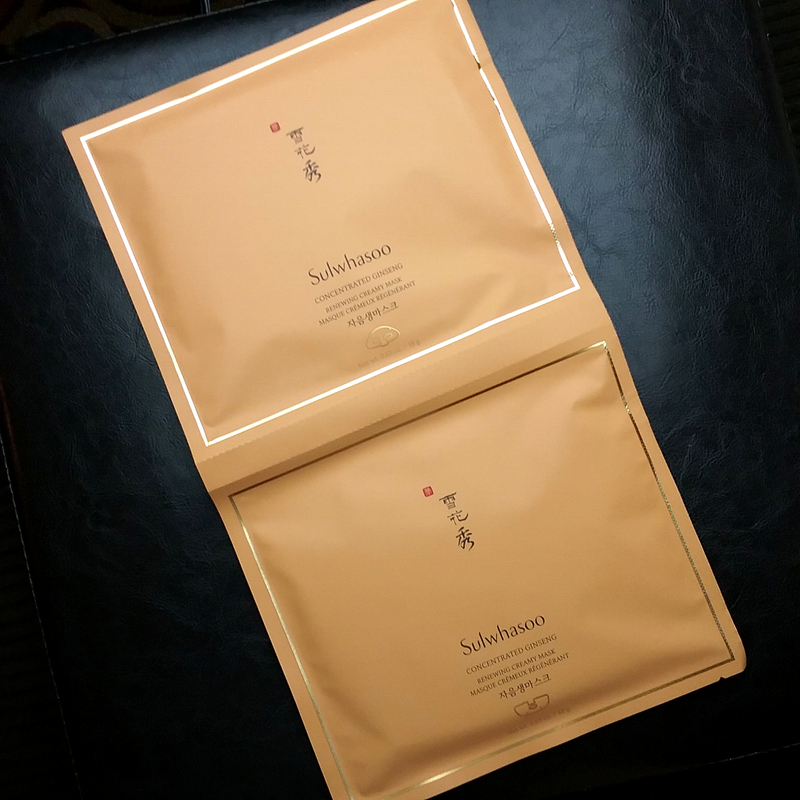 With every use of these masks, I’ve woken up to dramatically firmed skin; like the Sulwhasoo First Care Activating Mask, the Concentrated Ginseng Renewing Creamy Mask somehow increases the density (or appearance of density) of my skin, a quality that sounds strange when written out but makes a real impact when seen on a person’s face. Crepiness is all gone. For me, the next morning also reveals radiance turned up to 11, as my boss pointed out. The results are like applying one of those skin-blurring filters to my face, except that my nose remains intact and not blurred away like those filters tend to do. My boss’s results were similar to mine and looked even more dramatic, possibly because it’s easier to see changes in someone else than in yourself. Her skin was the first thing I noticed on the second day of our meetings. It looked refreshed and absolutely luminous. She informed me that even her daughter had noticed and commented on the difference. Win! We both agree that the results from these masks last a few days, too. That’s encouraging, given the high price per use for these masks. As we discovered anew, ingredient order does not predict product effects. Based on experience and results alone, therefore, I love these masks. If they were priced similarly to other creamy masks (let’s say $5 apiece) or even a bit higher (say, $10 apiece), that is where this review would end. But these masks come in a box of 5 for $120, making them $24 per mask, so let’s talk about that. I admit that I struggle a lot with discussing the objective value of skincare products. Much of that struggle comes from the fact that value, for me, is so subjective. It depends on your budget. If you can afford a thing easily, and you want to try it or you already know you like it, then it’s worth it to you. If you can’t afford a thing easily, then it won’t be worth it, regardless of how much you might love it. I will try to discuss the value as best I can, though. One way to examine the value is to compare the price and results to similar products. As I mentioned, most creamy sheet masks are in about the $5-10 range. These are way more than that. I do find the results much better and longer-lasting than other creamy sheet masks I’ve tried, but are they twice to almost five times as good? That’s hard to quantify. I would say not. 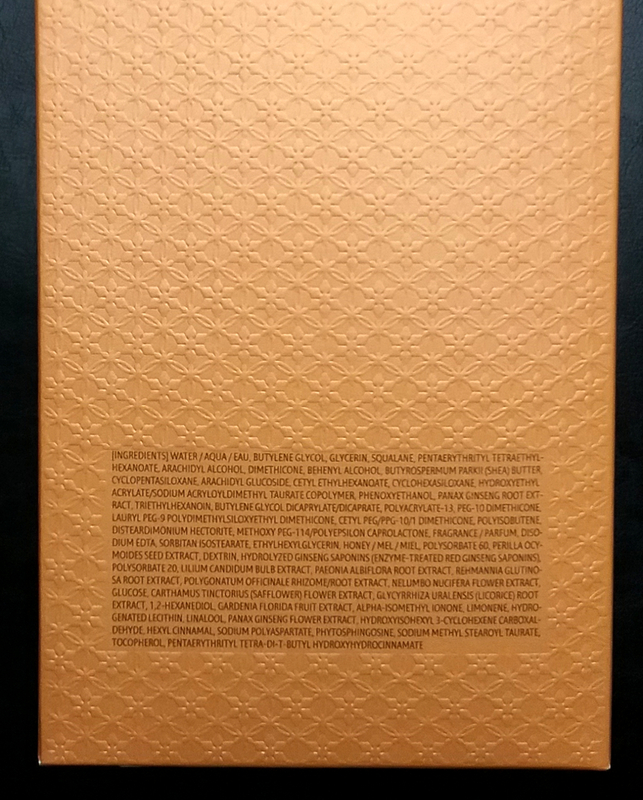 Ultimately, you do pay quite a premium for the excessive luxury packaging and material, which looks and feels wonderful but doesn’t add to the product results. Another way I wanted to examine the value of these masks in particular was by comparing their price to their avowed big sister in the same line, the Concentrated Ginseng Renewing Cream EX. Bear with me. Math hasn’t been my strong suit since eighth grade, and that was sometime in the last century. A jar of Concentrated Ginseng Renewing Cream EX is $240. A box of these masks is $120, half the price of the cream. Per volume, however, the amount of product (0.63oz) in the masks is about 31% of the amount of product in a jar of the cream (2.02oz). So by volume, you pay more for the masks than for the cream. Also remember that the essence in the masks is akin to an adulterated version of the cream (after all, it just contains “the essence” of it), so thinking about it that way, you’re paying even more for the masks by volume than for the cream, as the actual cream portion of the masks is going to be less than the 31%. Also remember that a box of masks is only 5 uses, whereas a jar of cream is…way more uses than that. If you already know your skin loves the Sulwhasoo ginseng cream, and you have the money for it, I think it’s a better value to just get the cream*. Looking at it both ways, therefore, these masks are not a good “value.” Again, if they’re in your regular budget or you’re ready to splash out and indulge yourself in something fancy and low-commitment, it doesn’t really matter, but if you are on the fence about trying them, those are factors to consider. On the other hand, the results of these masks on me and the boss are equivalent to or better than the results of a spa facial, and those are way more than $24 a pop, so there’s that. Where is the extra essence? Why can’t I have more extra essence? Is this a ploy to convince people to buy the cream? Conclusion: I love these masks to death for the way they feel and the results they provide, but I have a lot of reservations about them that have pulled down the numerical rating, primarily due to the price but also due to the amount of packaging waste they generate. Personally, I’d put these in the category of once in a while, luxury, special event splurges. I couldn’t see myself using them regularly. If you can afford to, though, more power to you, because the effects are spectacular. 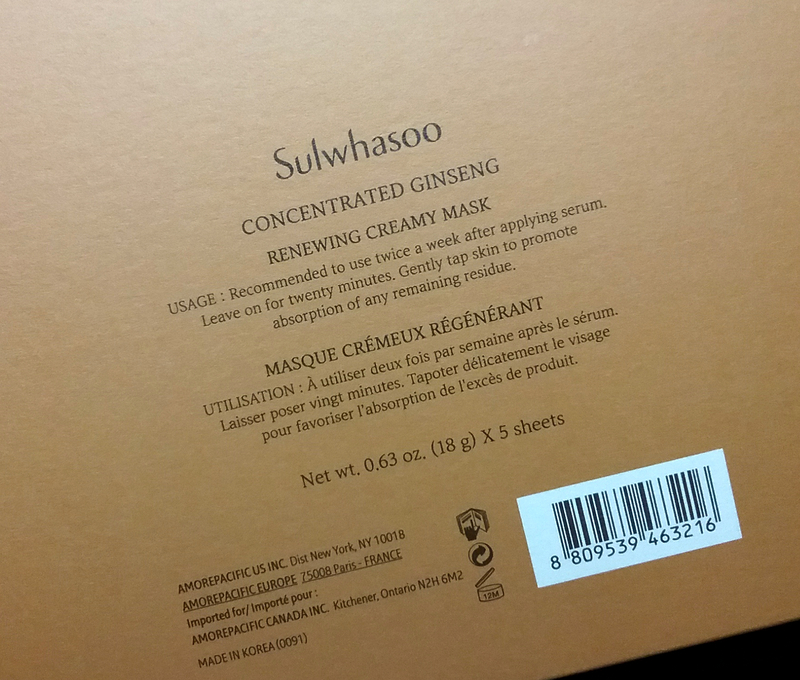 Where can I buy Sulwhasoo Concentrated Ginseng Renewing Creamy Mask? 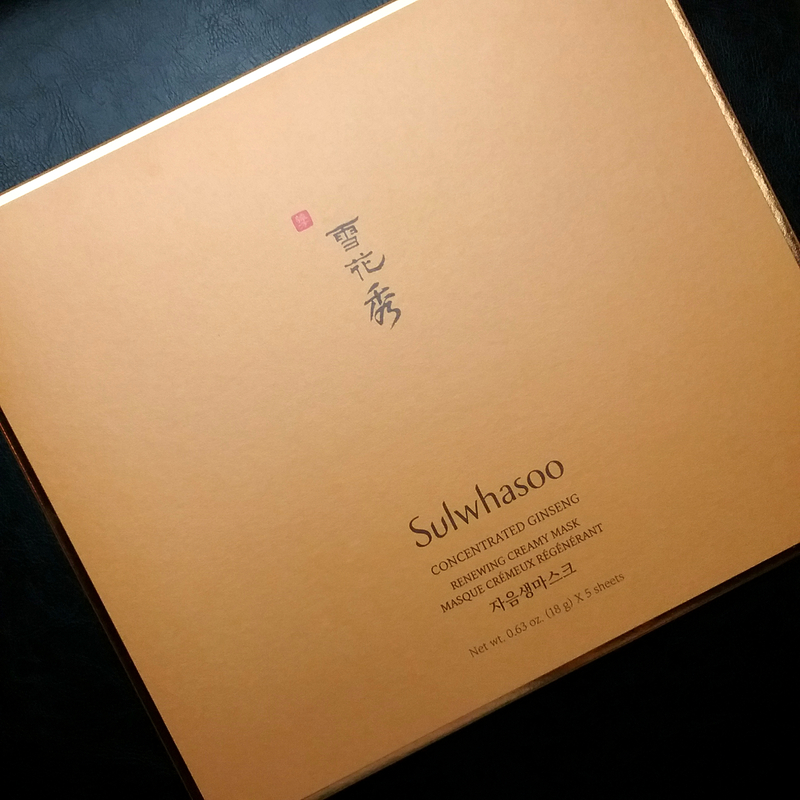 I received my box of Sulwhasoo Concentrated Ginseng Renewing Creamy Masks from Sulwhasoo US*, where a box of 5 retails for $120*. If you look on the right hand sidebar (scroll down to the bottom the page if you’re on mobile), you can find my Sulwhasoo US coupon code and current extra GWP offer. I really appreciate that you consider packaging and waste I a product. I do love sheet masks but don’t do them often for that reason. I haven’t tried anything suhlwhasoo but maybe after this review, I should! You know, I realize that I often don’t think of packaging waste. I needed an example this extreme to make me really think about it. I am glad that my eyes were opened to it, though! The plastic in these I believe can be recycled (I have it all set aside so I can look it up) but I am not sure about the pouches. I already recycled the box as that is cardboard.